"Serve this delicious dish when you have company and everyone will want the recipe!" Melt half the butter in a Dutch oven or heavy pot on medium heat. Add onion and garlic and cook, stirring occasionally, for 5 minutes. Cut chicken into bite-sized chunks. Sprinkle with salt and pepper. Increase heat to medium high. Brown chicken. Add curry paste, ginger and cinnamon and cook, stirring for 30 seconds. Add tomatoes, including juices, and remaining butter to pan and bring to boil. Reduce heat and simmer, covered, for 20 minutes or until chicken is cooked through. Stir in sour cream and coriander. Heat until very hot without boiling. Serve with rice or naan bread. Garnish with lime wedges. This creamy, classic Indian restaurant dish is easy to make at home. 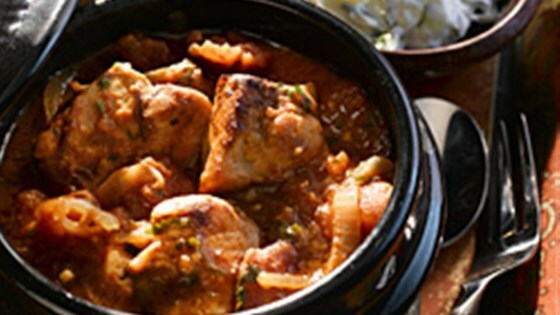 A traditional Indian dish that features tender bites of chicken in a rich, silky sauce. The sour cream in the raita will cool the mild fieriness from the curry. This dish can also be made with chicken legs.